As a budding teen, I regularly visited my dad’s office, working on my skill! Finally I could type my name! One day he asked if I would like to type an address on an envelope, so it could be mailed to a donor to encourage support of our family as missionaries. I had often helped with other aspects of mailing, but typing the addresses on envelopes was adventure! It took so long, however, to get one envelope done. Wrong keys! All of them piled in the upward position! But, oh I wanted to please mom and dad! I soon spent a lot of time in the afternoons, after school, addressing envelopes. I didn’t know it, but God was preparing for a larger focus. After we re-located to the United States, my mother continued to encourage my sister and I in music, as she had done during our missionary service. The Lord had provided the wife of a co-missionary to teach my sister and I basic music theory. Unfortunately, I was more interested in the typewriter, than the piano. Amazingly I did enough to keep my mother happy. In the Christian High School, located where we finally settled, I took the elective typing class, ending up being the fastest in class! The Lord, however, had other plans. He also wanted me involved in music. This was much more about Him, than me. The pastor of the church where we attended had me play Sunday school choruses. I listened to his wife play, and followed the simple melodies in song books. Soon I was doing well enough to give a little pitch and form to excited children as they sang. My interest grew. My parents paid a teacher to help. Sadly, she was not able to motivate me to the self-disciplined approach that had accompanied my work on the typewriter. That is, until God prompted her about the “Bells”. Suddenly during one lesson she said, “If you will practice, I will teach you the bells!” She then played the most beautiful series of notes on the piano that I had ever heard, sounding like church bells. Absolutely amazed, I promised myself that I would prove worthy of being taught those bells! The next week, I climbed the steps of the large, vintage mansion, excitedly. She led me past the array of pianos for sale, to the one at the back that she used to teach on. Oddly enough, pianos now attracted me more than before! I wanted one of my own some day! She then told me how to hold my fingers, and where to put them. I was to strike the notes in a firm staccato fashion, while holding the expression pedal down. Within a short time, I had begun to make a sound like bells! From then on, my ears seemed tuned to another world. The “music of the spheres” in, “This is my Father’s world”, had spoken to my spirit! Did the typewriter journey relate to the music? From then on I played for different reasons, sometimes even for an hour or two, often playing improvisations on my own. My mother told me how good it sounded. I accompanied quartets, trios, and the College Choir during High School and College. I often played instruments in the churches I pastored, not to mention weddings and funerals. I have also taught and recorded music. 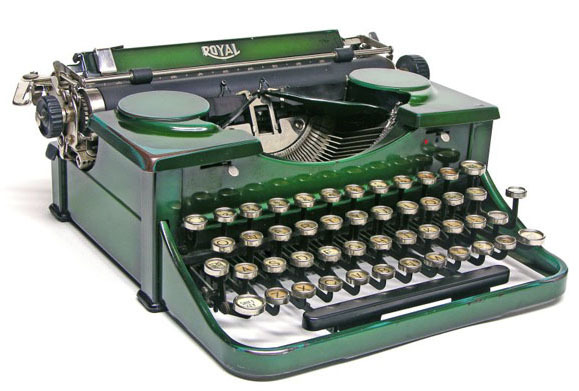 Typing skills led me to electronic typewriters, computers, and corporate office machinery. These skills helped to support my wife and I over the years. It was music that captured my spirit, tuned my heart, and the heart of others to the music of heaven itself. I had pleased my parents, and I had pleased God. I recognized Him in the bells. Even my mother’s dying statement was, “I just heard Paul playing the piano.” We were continents apart at the time! “Delight yourself in the Lord . . . He will give you your heart’s desire.” Psalm 37:4. Well, if that’s the case, people in general can be impressionable at times – even the natural world is impressionable at times – so I’m not alone! (See earlier blog "Hand Organizer"!) Even as I write, this particular winter seems to be making a statement – one of the worst in years! But, I have discovered a most interesting thing in my study of scripture – that this was Jesus’ strategy in communication, and we know that He wasn’t out just to impress folk! Of course that doesn’t give me any excuse to go around merely impressing people – that would backfire very quickly, and people would quickly have a name for it – like sensationalism, or some other impressive word! Jesus was out to communicate biblical truth clearly and lovingly. He was out to see change in spiritual perspective, and bring powerful challenge towards transformed living. With that in mind, and with due caution that a teacher always gets checked out first, His strategy can be studied and followed. In Mark 4:30-41 Jesus takes on an area that he is sure His followers don’t really understand yet – and that is the subject of the “kingdom of God”. He points out that the “kingdom of God” is like a tiny mustard seed. When it is sown in the ground, it grows up to be a large garden plant, providing large branches so that birds can build their nests in its shade. Later, in the evening, he has a chance to prove his point! He suggests going on a boat trip. (I think that He has a good idea of what was going to happen, don’t you think?) The scripture tells us that there were several boats. As they sail, they encounter high winds and stormy weather! The waves were spilling into the boat! Guess what, Jesus is sound asleep on a pillow in the stern of the boat. He is about to illustrate the transferable concept he had just spoken of – “the kingdom of God is like a mustard seed that grows into a tree.” It is as if he views the storm as an unruly child, “Peace, be still!” Everything grew completely still. Mystified and fearful, they were ripe for his chiding about their lack of faith. They still hadn’t put two and two together – they were more impressed with his power, than they were what he had just taught and illustrated concerning the mustard seed and the kingdom of God. Little ideas can have amazing impact! They had not visualized the kingdom of God and its nature. But Jesus had demonstrated it so that it could become a transferable concept when they needed it. Now here is the irony of all this. I have found that the Lord Jesus is still doing it! If you indeed have received the Lord Jesus as both Savior and Lord, He will also enable you to see scripture in a new light that you had not considered before, if you spend time in it with Him. In fact, you may encounter a storm on your little “lake”. Those who don't know Jesus may see it as just a storm. A short while later, some kind of event occurs that makes you feel you have been treated unfairly. Then, you cry out, “Lord, aren’t you going to help?” He does, and then chides for lack of faith. Even as I write this, I saw Jesus calm a storm that had come just as suddenly as that windstorm on Galilee, when Jesus stilled it. I was shocked how quickly the storm listened to him! I guess I’m impressed! How about you? MAINTAINING A FAITH-FOCUS in life is not a problem – at least most of the time! When you know something is right, prepare well, and wholeheartedly begin, you expect to meet your goal. Sometimes, however, the unexpected occurs. Be sure to keep heart! Eternity alone will reveal what was actually in his heart that morning, but I am now more aware of what was in my own. Caught totally by surprise while I was exercising and praying, I didn’t know what to say, or how to respond, so I had to depend on the Lord. Other times I have not given, because I felt it unwise. When Jesus went to Tyre, (Mark 7:24-30), he was also living for His Father “in secret”. He also was surprised when a Greek woman of Syrophonecian origin asked for a special favor. He promptly told her of His priorities to meet the needs of the “children” first. “And she answered and said unto him, Yes, Lord: yet the dogs under the table eat of the children's crumbs.” (verse 28) She was ready for him! He then answered her request. On the other hand, for all I know he may have had other ideas in mind. He may have been frustrated that he couldn’t pull them off. Have you ever been caught doing good, but did not recognize it until you saw its product? During the Lenten season, we see Peter’s devotion, but also his failure to see its product when he denied the Lord three times! This Lenten season, let us not deny the Lord by our lack of faith. IT WAS A WET AND RAINY FRIDAY EVENING, in December, and I had just stopped work for the day. I was looking forward to eating at a new restaurant along with my wife, which was offering a “buy one, get one free” evening meal. I had carefully noted directions, wanting to be sure that I got there at the same time as my wife! As I exited the freeway, this passion lingered, and was getting harder to control. I came to a stop in the right hand lane, carefully planning my right turn and merge into traffic. Due to road conditions, I was also preoccupied with my personal safety, not particularly the safety of others! As the traffic cleared, I merged right, and proceeded to pick up speed. Out of the corner of my eye, I detected a long, sleek sedan pulling in behind me. Soon this car lit up with red, white and blue lights like a Christmas tree! Realizing it was a policeman, I picked a secondary road and pulled in. After showing him my registration and driver’s license, I was told to wait a few moments. He soon returned, with a ticket for $110, saying, “You can either pay the fine or appeal it within 21 days”. God occasionally takes us on a journey to understand our heart. We need to remember that God, our Heavenly Father decided this. He calls us to remember that we are still being loved and being forgiven throughout the process. I had just recently been praying that our city residents would be more conscious of their responsibility to God! That is a huge prayer request, and far more involved than a quick “fix-it” scheme! Even the ancient Jewish, Levitical priests, knew better than to barge into the “Holy of Holies” without a rope attached to their ankles, in case they were struck down dead for presuming upon God. I had also been focusing my study on Romans 13 concerning God’s ministers, some of whom are the police. I now had fresh material – in my own experience! I had “proof” that God was answering that prayer. He was starting on me! I also had a new spirit of love towards those who felt sorry for me, since I had not initially seen the sign. They felt I could contest the charge. But I now realize that the Lord wants us all to be lovingly passionate for the cause of Christ, and now knew there was only one way. God will care about your “cause” when you care about His! Christmas is a wonderful time to practice honor in giving! After all, is that not what Jesus did, when He came to our earth? One particular year I thought I would like to try to do scheduling and note-taking on a small hand-held organizer. So, I put it on my Christmas "wish list". I had a cup of hot tea in the other hand, with some honey for taste. I sat the tea on the grass, and proceeded to work. After a little while, I grew thirsty, so, keeping my eyes on the screen of the organizer, I put my hand down towards the grass, feeling for my cup of tea. I found it fine, and brought it to my lips, my taste buds anticipating the rich flavor. As I swallowed it, however, it burned my mouth! It felt as if I had swallowed water that had just come from the stove! With all of the gusto I had, I jerked the cup away from my lips, and spit it out. Tea flew everywhere, drenching my organizer in the process. I was hopeful that I hadn't burned my mouth too severely, and wondered what I was going to do about the wet organizer! But, the hot, biting sensation was still there! "You little thief, how dare you," I remonstrated. I wasn't impressed, to say the least! Why would a loving God allow one of His little creatures to spoil a perfectly good afternoon; an opportunity to learn more about my gift; and a perfectly good cup of tea! But, some months later I was reading a scripture that had a familiar ring to it. Wondering why it spoke so clearly to my journey in the Christian life at the time, I remembered the above incident, and experienced an "aha", or "moment of truth"! So that's what was happening! Just like God had allowed Satan to bring a "thorn in the flesh" to the Apostle Paul, thus helping to keep others from thinking he was too special, and a "messenger of Satan" to deal with his pride over revelations, He was allowing something similar to happen to me. (2 Corinthians 12:7). We think we are in control of life - but we are not! We are stewards! I had forgotten to account for the fact that Jesus wasn't sacrificing His life so that we would feel acceptance in having our own way, but to demonstrate God's far superior, and more joyful way of life. The apostle Paul's salvation from Christ was a wonderful thing - but there was a danger of seeing too much of himself in it. It was a personal gift to the apostle that represented God Himself! Too much knowledge about the gift could destroy the simplicity and wonder of the gift itself. An old saying puts it well, "Don't look a gift horse in the mouth!" Previous generations could approximate the age of a horse, by looking at its teeth. To inspect the gift too carefully would destroy the purpose of the giver. If the horse is healthy, maybe he just needed to see a dentist! Eternal matters do need to take first place in my life! I do need to treasure all that I have been given, even my Christmas gifts. But, I should always remember to focus on the spirit of giving behind it all, the Holy Spirit, or risk destroying the very purpose for which it was given. I had been caught in the wrong spirit! I was in danger of that when everything had to be "just so", as I learned about the organizer, rather than the function it was meant to provide. That was not what my children intended. Even the bug seemed to recognize my spirit, and thought he would "cash in" for a freebie too. He didn't relish the idea of being a part of someone else's experience, however! There is a balance that God has placed in nature. Knowledge without understanding, (Proverbs 2:3-5), however, is inconsiderate and cruel. If I really enjoyed eating little bugs that much, I should at least have had sense enough to put them out of their misery first! But, God's gift is free! His salvation carries every benefit that can be conceived. If I concentrate on Him, I might just be able to drink my tea without bugs, as I learn about my organizer . . . that is, unless God wants me to learn more about the nature of bugs. He creates all things for us to enjoy. “Can I buy a stamp, please?” “Sure!”, I replied. As I reached for the stamps, I mused, “Retired? No way!” Expectations at my previous job had escalated while resources were down. I had changed jobs, hoping to balance the scale. Expectations were up. Morale was low. On Sunday the pastor challenged, “Times like these qualify as trials. Learn to count them as joy! A great opportunity awaits to show love for the Lord – a witness to His saving grace!” All of this was true, even if I was a “senior citizen”! I mused on, “I don’t think like a senior citizen! I don’t feel like one! I’ll do without senior privileges!” Even when given a senior discount at a restaurant, I wanted to say, “That’s nice, but I’m not old enough! With a desk all my own, and responsibilities similar to High School days, I was actually enjoying life again. Suddenly I was jolted into the present: “Am I getting ‘Old-timer’s’ disease?” The roll of stamps I had purchased with my own money – was gone! Accusation whispered, “You’re going too far with this love thing! A few stamps are OK – but a whole roll? My heart fought the truths of unselfish living. Was it all a lie? Frantically I emptied the drawer. The stamps were not there! My neck stiffened in response to my injured pride. A recent robbery of laptop computers and peripherals underlined my dominant thought – stolen! I dreaded explaining this all to my wife! I reported the incident to my supervisor, who e-mailed the employees, telling them I would not be selling stamps any more. The problem seemed to be cared for. Some were sympathetic. But, I missed serving my co-employees. I sensed a gnawing emptiness, and then . . . There they were – the stamps! The roll was on the floor, under my desk! “The thief dropped them there”, I thought. Soon I realized it had fallen out of the back of the drawer! My supervisor had restored temporary comfort and safety, but this also cut off further opportunities to be of service! I was embarrassed that I had blamed others for my problem! Proverbs 18:9 was clear, slackness and destruction were related to each other! My spiritual integrity had been challenged. A focus on temporary loss blinded me to the agelessness of Christian character. (Proverbs 17:4). If I was to continue being a servant/witness for Christ, I had a choice. I had to apologize for blaming someone else for my problem. Age, position and earthly comforts are relative. Character expressed in conscientious love is timeless. When credibility is gone, words say little. Acknowledgement of failure can bring it back. Son of Missionary Parents in South Africa, Born in Swaziland, Homeschooled for first few years, Started H.S. in South Africa, Completed College in USA, Returned to South Africa as missionary for 10 years.